Sydney sparkles and dazzles. 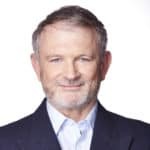 Bernard O’Shea dons his walking shoes, takes it all in and feels great to be alive. It’s so easy to fall in love with Sydney when you first set eyes upon it. In the sunnier, warmer months especially, it’s a city that sparkles. The shimmering surface of its massive harbour and the stupendous views from the Opera House, Habour Bridge, Botanical Gardens and other viewpoints along the shore give it a grandeur that few other cities can match. Its splendid beaches, too, are the envy of many other nations and their residents. 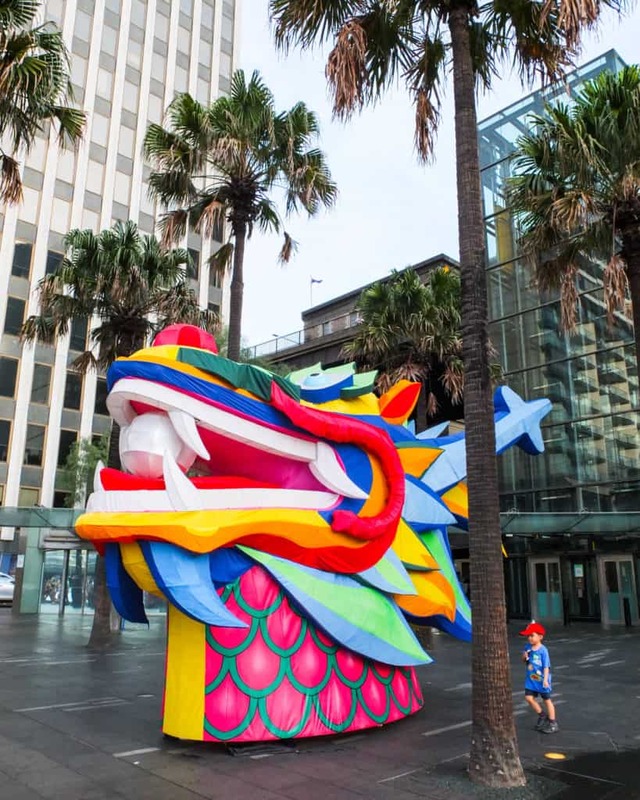 Yet away from the water, the central business district can be a bit of a puzzle for tourists: there isn’t really a historic enclave or central social gathering place. Instead it’s very much a mish-mash of the old (in Australian terms) alongside the shiny new (that’s Sydney town planning for you!). Its gems can be overshadowed and almost hidden amid all the glass towers and office blocks. 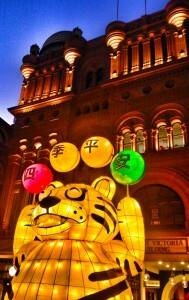 Chinese New Year colour at the QVB. When you have lived and worked in Sydney for 20-plus years, as I have, when you are caught up in the daily grind, you can easily take its charms for granted or overlook them altogether. Australia’s largest city can be a heads-down, no-nonsense kind of place to work in. But take a deep breath, make a little effort, allow yourself to be a little more open and receptive, and you will soon find yourself back in the land of wonder. The Town Hall and Queen Victoria Building (QVB, pictured right), for example, are both magnificent buildings dating from the late 19th Century; yet they face each other across a busy, noisy intersection and can almost get lost in the background amid all the hubbub and commotion that takes before them. The fat yellow cat in the photograph above put in an appearance for the Chinese New Year. The genial, grinning creature is bidding you to stay safe and sound in the four seasons of the year. At night, when the Town Hall is lit up in unusual colours, its beauty and rich detail can be astounding. Some nights it can be a glorious blue, other nights a startling red or green, and during the Vivid festival it can be anything. These are the times when you forget about rushing for your bus or train and stand on the pavement, gawking, absorbing its splendour and beauty. And on some nights, of course, it is its “plain” old sandstone self. You have to save your fancy clothes for special occasions. Recently, I have been trying to think and move like a tourist in my own town. To carry my camera with me or make more use of the one in my phone; to look out for unusual, photogenic shapes and colours. To go for walks after work, instead of heading straight for the train station, to explore. 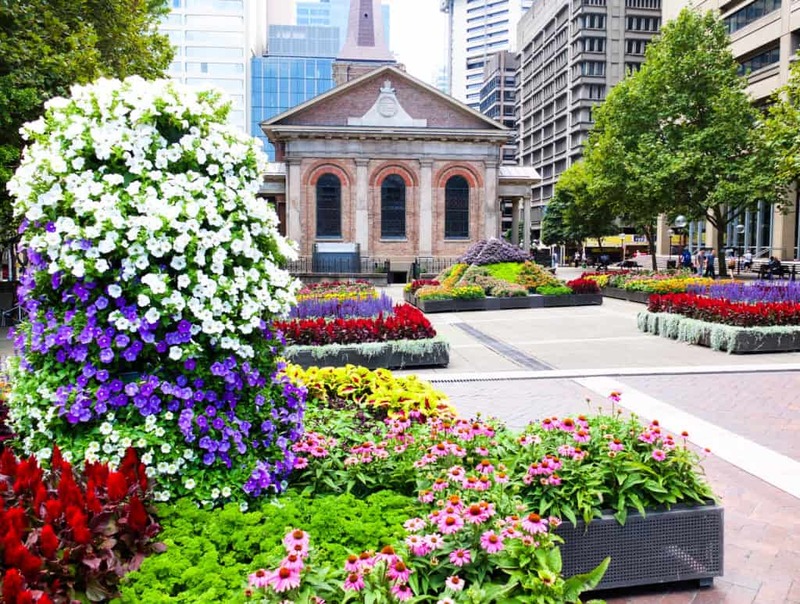 Sometimes you can come across something quite startling and unexpected: a jigsaw puzzles of flower boxes adorning what is normally an expanse of concrete, or colourful decorations put up for one of the many festivals that take place in Sydney over the summer months. Hyde Park – Australia’s oldest park – is a great place to get some sanity in the city. The Hyde Park Fountain is always popular – children will frolic and splash and delight at the turtles and other statues in the fountain, and tourists will take selfies there while on their way to visit the Catholic cathedral, St Mary’s (Hyde Park’s majestic neighbour). Nearby under the trees closer to the city, a large chessboard has been set in the concrete, and chess aficionados will gather here to ponder over some serious, solemn matches. The Metro St James cafe, above the tunnel leading to St James railway station, is the perfect spot for after-work drinks on summer nights. A fun spot in Sydney. On weeknights, when I leave the office, I go for a walk in Hyde Park at least before heading home, for even in a relatively small city park there is a soothing freshness in the air. From there I might head on down to the Domain, past the Art Gallery and into the Botanical Gardens then cut back to the Opera House to Circular Quay to catch my train, or if I am more pressed for time I will head down Macquarie Street past the Hyde Park Barracks, NSW Parliament and the library to Circular Quay, which is always buzzing. For something different, another great spot that is easy to walk to is Darling Harbour, to the west of the CBD. Upon arrival, even though it is still unmistakably Sydney, you feel like you are in another metro zone. There is usually some festivity or something going on here, depending on what’s on the multicultural calendar. 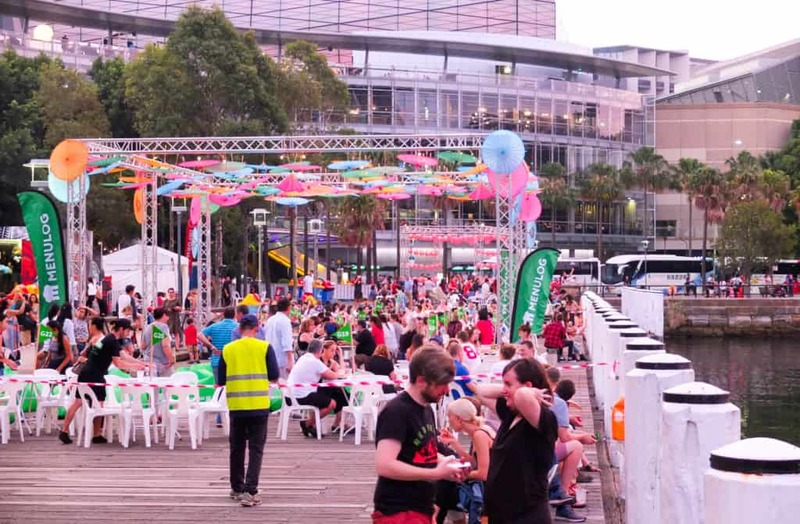 A food festival in Darling Harbour, with the Casino in the background. There is a large pedestrian bridge over Darling Harbour. Pause halfway over the bridge and take in the views – of the historic boats and ships moored by the Maritime Museum, the activity down by the ever popular Sydney Aquarium on the northern side, and on the southern side of the bridge, the IMAX theatre precinct. The scent in the air will be a mixture of sea salt and tantalising aromas coming from the surrounding restaurants.